In a large pan, brown meat with garlic & onion. Add sea salt, black pepper, oregano, basil & Worcestershire sauce to meat. Add tomatoes, chicken or beef broth and rice. Cover with a lid and simmer on low heat for about 20 minutes or until the rice has cooked. Wash and cut peppers and remove any seeds. Place facing up in a baking dish. 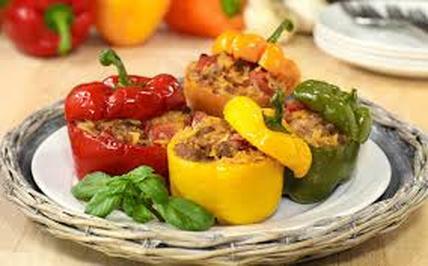 Fill peppers with the meat and rice or quinoa mixture. Place peppers in the oven for 15-20 minutes at 350 degrees.